The top goal scorer Cristiano Ronaldo is back in Real Madrid’s scoring lineup. A double against Real Sociedad has placed the Real Madrid striker to second placed in the top scorer list in the Spanish League. The Portuguese has scored already 14 goals in 17 games he has played so far. The best version of no. 7 is returning to the delight of all Madridistas. Cristiano Ronaldo yesterday entered with the option to regain the top scorer’s title in a single day. He missed one of the two penalties which released and pardoned a clear hand to hand with the goal of Rulli. 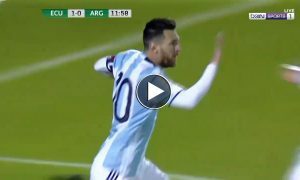 The Argentine goalkeeper pulled a magnificent walk to thwart a counterattack of Real Madrid. After many attempts in the second half, Ronaldo hit a spectacular volley for Real Madrid’s second goal. Luis Suarez could only endure Cristiano Ronaldo marking another brace against Betis to reclaim the top goal scorer in La Liga. The Uruguayan has 15 goals in this league, one more than Cristiano Ronaldo and team-mate Neymar. The other three big stars of the league are Karim Benzema 11 goals, Gareth Bale 8 goals and Lionel Messi 6 goals. After all the matches of 2015 being played out, Cristiano Ronaldo stands once again as the top goal scorer in Europe. His impressive record of 57 goas in 57 matches for both the club and country make him Europe’s top goal-getter for the fifth consecutive year and let’s not forget this is the worst season of the Portuguese in terms of scoring ratio. Cristiano Ronaldo wants to win collective awards as well as he is well aware that being individually superior does not mean a lot. Despite finishing as the top scorer last year Cristiano Ronaldo’s chances of winning the prestigious Ballo d’Or award are much lesser than Lionel Messi who on the other hand enjoyed five trophies with Barcelona in 2015. For Real Madrid to be the best other members of the team have to respond because the goals of best player in the world are of little use if there is not the necessary balance defensively. Real Madrid’s BBC vs MSN from Barcelona, the two of the deadliest trio in football world at present. Comprised of six most deadly forwards in the world the two groups have gone nuts against each other when it comes to goal scoring. However now a day people often give MSN an edge over BBC keeping in mind their current goal run. But the data suggests that Real Madrid’s BBC have scored the same number of goals this season in La Liga as the Barcelonan trio. Yes, it is true that Messi has been two months off the pitch but on the other hand Bale has also lost much of the league as well as Benzema has been out for a few matches. BBC vs MSN, the two tridents have added 35 goals each in the national league championship so far. At Real Madrid, Cristiano Ronaldo has scored 14, Benzema has already gone up to 12 while Gareth Bale and has nine after he scored four in Mestalla on Sunday. Without being a superlative level, the Real Madrid triplet front has held the team scoring 35 of the team’s 46 goals in the league. Lionel Messi, Neymar and Luis Suarez at Barcelona are in great form and some even were suggesting that all three should have been in the final of Ballon d’Or final list. However the fact that a player cannot get the golden ball for his half season, cannot be ignored. Neymar and Luis Suarez have been dominant in this season only and in last season they were nowhere near Cristiano Ronaldo’s level. The Real Madrid striker despite having his worst season of the career is giving the tough challenge to both Neymar and Suarez in scoring goals. So far Luis Suarez has scored 15 goals, Neymar fourteen and Leo Messi just six goals in La Liga totaling to 35 as Real Madrid’s BBC. Cristiano Ronaldo and his son are like two souls and one heart. The cutest father-son football duo in the world are a real charm when found together. 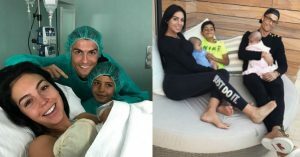 Though Cristiano Ronaldo has not revealed the mother’s name, his fatherly love has got the shortage covered. “For me it is not a problem. I will say in the world, many kids don’t have mum, don’t have dads or dads die or mums die… Cristiano has a dad, an unbelievable dad. [He has] a grandmother, I have the support of my family, great of course,” the 30-year-old soccer star said on The Jonathan Ross Show. Cristiano Ronaldo is the richest footballer in the world that makes his son also an ironic kid. Growing with a millionaire is not easy for a child of Cristiano Jr’s age. Cristiano Ronaldo knows the risk and has taken all the responsibility of son’s growth in his own hands. The whole world knows Cristiano Ronaldo as the richest footballer in the world while his haters call him selfish and arrogant. Incredibly talented, filthily rich and ultra-famous, Cristiano Ronaldo has many faces for the world. To some people he is the worst nightmare especially the ones who had to face his brutal penalty kicks while on a goalkeeping charge while to many he is the life savior. Born in Madeira and picked by Sir Alex Ferguson the 30 years Old Portuguese has an incredible life story. “You need to understand where Ronaldo comes from,” the Spanish author Guillem Balague tells us. “He had absent parents. His dad was an alcoholic and his mother had to become the head of the family, so she was never there. “He has had a lack of fatherly love, if you like, and psychologists believe that when that happens, you spend all of your life looking for a replacement. Sir Alex filled that void. He told Cristiano that he would look after him and he did that”. Cristiano Ronaldo’s inclusion into Manchester United camp was a challenge in itself as he had to deal with some of the most egoistic player. “The attraction of Real Madrid was already there for him but if he’d gone there as an 18-year-old, they wouldn’t have had patience with him. He may have been lost to them because at that age, he wasn’t consistent. Cristiano Ronaldo has always been known for his amazing style and attitude off the field. No wonder, he is the coveted ambassador for most brands.Nike Football is one of the companies that has managed to have Cristiano Ronaldo endorsing them. The hot footballer has starred in many amazing commercials by the sports accessories company. 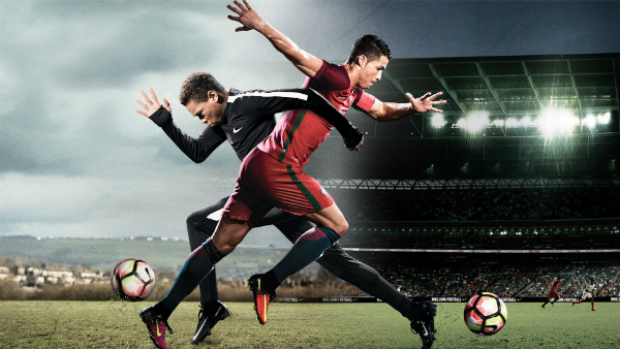 Recently, they came up with “The Switch”, an amazing Nike commercial starring Cristiano Ronaldo and Anthony Martial. The five-minute film also stars other soccer players like Harry Kane, Ricardo Quaresma, Mascherano and Andrè Gomes. But Ronaldo and martial play the lead. Cristiano Ronaldo is one of the biggest names in the world of soccer, and for good reasons. Not only has he successfully led his national team Portugal to achieve several wins and great footballing displays, he has also been an exceptional star as a representative of his club, Real Madrid, which he joined after showing his great skills at Manchester United. He is a through and through team player, and at the same time, his personal records are also exceptional. 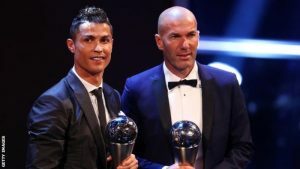 Recently, he received the honour of UEFA Best Player of Europe 2016, putting to rest all speculations about his decline. 20-year old Anthony Martial has been a member of France National Football Team since 2010, and has already won the attention of the people with his amazing skills. A current ManU player, Martial was brought to the English team with the highest amount ever paid to a teenager in the history of football. He received the honour of the 2015 Golden Boy Award for the best under-21 player in Europe. Nike brings the two players – a former ManU star, and a current one – together, along with some other well-known faces, in this unique commercial. It has an interesting storyline – we will not give you spoilers by describing it, but give you a hint; as it might be evident from the name, Ronaldo and Martial end up having a body switch! How does it happen? What happens to their lives after the switch? To find it all out, you need to watch this amazing short by Nike. The fast and furious Real Madrid line up is in road side troubles these days. Following Real Madrid’s mid-week victory over Real Sociedad Real Madrid’s front-man Gareth Bale was caught trying to leave the stadium from the wrong lane. The Welshman then had the call from an irritated Spanish policeman as he directed towards the right lane. Followed by Bale the Colombian midfielder James Rodriguez also had a traffic police chase as he was rushing to training last day. James Rodriguez is facing a severe economic penalty for disobeying police orders. The Colombian was ‘caught’ more than 200km / h circulating in the M-40 Madrid last New Year’s Day. He argued that he heard no signals while police urged him to stop the vehicle several times. The fine would reach 30,000 euros according to El Mundo as it is a crime of disobedience to authority. The attitude of James Rodriguez, who never wanted to stop at the evidence, could pose a serious offense as indicated by the Public Safety Act. In addition, the ‘golden boy’ would have to pay another 20,000 euros more for a crime against road safety also facing a year of driving license withdrawal. Real Madrid man however has also came up with a brilliant excuse. Firstly he told that he did not hear the siren because he had the music too loud and secondly he thought he was being kidnapped. Real Madrid being the richest club in the world offers some extraordinary wages to its players handing them the chance to have some of the most expensive and fastest cars in the world. Cristiano Ronaldo, Gareth Bale, Benzema, James all the stars have a fine collection of their personal vehicles featuring world’s best cars. The white squad being the pace-lovers in the world football love to go with fastest cars whenever they find a chance. Gareth Bale took another step forward in one of those games in which the best of the best players in the world were expected to score. Welsh footballer, who is going through a great form, scored in a game away from home, something he had only done once this year. The goal away from Santiago Bernabeu resisted the opponents to register a victory. So far this season he has just done away from the white home in the match against Eibar last November 29. Gareth Bale was responsible for opening the scoring in Ipurua in a match that ended in imposing the set of Rafa Benitez by two goals to zero. Although it is true that the white sprinter was injured during the first part of the season. He dragged a calf problem which kept him out for several weeks, but afterwards, out of eight goals in the league so far only one had been an away. The Welsh tried his best to get his side through victory in a game which was considered much important for table leaders. Real Madrid eventually finished with a draw losing two important points to reach the top of the Liga table with Atletico Madrid. He scored twice against Betis in the second game of the season, he made another strike as Real Madrid beaten Getafe in the 4-1 run and 15 days after he scored a poker of goals against Rayo in the historic 10-2 victory over the Paco Jemez side. The whole Real Madrid frontline has been criticized for not performing in the matches which are really vital. Gareth Bale and Karim Benzema both scored in a match that was marked with some harsh refereeing decisions. However the Portuguese star Cristiano Ronaldo could not do enough magic to get his side past Gerry Neville side. Real Madrid side is still 3rd in the table followed by Barcelona and Atletico Madrid. ‘Cristiano Ronaldo was the most gifted player I’ve ever managed’ the tributary words are from none other than the legendary Sir Alex Ferguson. The former Manchester United manager whose management era with the Old Trafford side is known as the ‘Golden era’ has been hailing the current Real Madrid striker whenever he got the chance. The former Manchester United boss has admitted time and again that Cristiano Ronaldo is unreplaceable. “Cristiano was the most gifted player I managed,” Ferguson wrote in his autobiography. “He surpassed all the other great ones I coached at United – and I had many”. Well that was quite later in Ronnie’s career that people started getting him known for his landmark performances. The factor that urged Ferguson to enroll a young Cristiano Ronaldo into Manchester United camp was his performance against the manager’s team. Manchester United got Cristiano Ronaldo at a time when Barcelona, Inter Milan and Valencia all were eyeing for the Portuguese. Sir Alex Ferguson picked Cristiano Ronaldo after some Manchester United players hailed the young Sporting Lisbon striker’s display against their team. Alex Ferguson revealed that after a friendly with Sporting, United’s players “talked about him constantly, and on the plane back from the game they urged me to sign him” and that “he is one of the most exciting young players I’ve ever seen,” Cristiano Ronaldo was then purchased by Red devils as the new era in football history begun. United are reportedly willing to pay Ronaldo £250,000 a week to return to the club he first joined as a teenager in 2003. But that seems very much difficult at the moment as the striker is having a great scoring rate with Real Madrid. Real Madrid trio shines again as their side notched up a historic win over Rayo on Sunday. Gareth Bale, Karim Benzema and Cristiano Ronaldo, all three Los Blancos front-men got their hands on the ball in a 10-2 demolishing of Rayo Vallecano with the trio scoring 9 goals in total. The deadliest trio in football world has been in superb form since Bale and Benzema rejoined the camp after recovering from injuries. Though the majority of the finishing-job was kept in hands by Cristiano Ronaldo and Benzema, Gareth Bale has also been playing the perfect role of a playmaker. On Sunday the Welsh decided to take the charge himself after what happened against Villarreal, and went on to score his first ever four-goal haul with Real Madrid. Real Madrid’s BBC have scored 46 La Liga goals in total in the year 2015, 31 of them coming in the current season. Gareth Bale has now scored six times in his last four matches. Real Madrid are now just two points behind the table toppers Barcelona and Atletico Madrid as Catalans skipped their league fixture for Club World Cup games and City rivals lost to Malaga. Both Cristiano Ronaldo and Gareth Bale have been linked with a move to Manchester United earlier. But seems they are enjoying their time at Santiago together. Cristiano Ronaldo and Gareth Bale has a lot in common. Both superstars are two of the most expensive players in the world ever signed by a club and both enjoy the status of being the fastest footballers at present. Though Gareth Bale has not been of much success at Real Madrid as compared to his former club, he is getting used to be a part of Los Blancos essentials alongside Benzema and Cristiano Ronaldo. 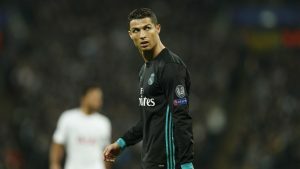 Being the most expensive one sometimes can make you a little egoistic and according to reports this has been the problem of Real Madrid dressing room that has to be settled down soon. Haidar, a 3 -year-old who lost his parents last November in an attack in the Lebanese capital, Beirut, just got his dream to meet in person with Cristiano Ronaldo, true. The young Cristiano Ronaldo fan was the survivor from last month’s bombing in Beirut that killed over 40 people including both his parents. “Haidar, a three-year-old child who in November lost both of his parents in bombings in Beirut, saw his dream come true on Friday when he was given the opportunity to meet his idol, Cristiano Ronaldo,” Real Madrid said in a statement posted on its website. The young Lebanese was welcomed by club president Florentino Perez who also arranged for a short trip to the club’s trophy room. “Following the brutal attack in the Lebanese capital last month, the story of Haidar, photographed in a Real Madrid shirt after surviving the massacre, came to global attention,” the statement said. Haidar was also gifted with a Real Madrid shirt with his name and Cristiano Ronaldo’s jersey number printed on it. In addition, this Sunday he will also be present in the derby against Rayo, most probably will enter the ground holding the hands of his idol, Cristiano Ronaldo. This isn’t the first time Real Madrid and Cristiano Ronaldo have arranged a day to be remembered for a fan. A few months back a Syrian refugee boy was also brought up by the club who was humiliated by a camera-women earlier. Real Madrid also arranged a job for Syrian’s father who had been working as a football coach back in his country apart from enrolling the young one into one of its subsidiary clubs. The best club and the best footballer in the world keep winning the hearts together.